The Bulls saw the Suns Saturday night in the United Center. The question is with a 112-107 victory have the Bulls started to see the light? You never know with this Bulls team. But Saturday was a good start for a stretch of seven straight home games through March 5 without a back to back. You’d point to five of the next six games against teams with poorer records, except the Bulls have lost 10 times this season to teams averaging more than 10 games under .500. So even though the Suns with new players coming in after multiple trades Thursday shot 53.4 percent and scored 107 points; and even though the Bulls committed 17 turnovers for 22 Suns points and were outscored on fast breaks 23-12, it was a much improved effort for the Bulls with 12 of 24 on threes, strong bench production led by Taj Gibson and Aaron Brooks and a solidly efficient game from Derrick Rose with 16 points, five assists and just one turnover. And just before Gasol’s vital shot, Rose blew through the defense for a tough driving score after a nifty crossover move when the Suns got within 104-99 with about two minutes remaining. It was not only a much better effort, but also the way the Bulls need to play more often with a team that is much stronger offensively. The Bulls got 19 points from Jimmy Butler, 15 from Mike Dunleavy and a dozen each from Gibson and Brooks, the reserves breaking open the game with 19 straight points to open the fourth quarter. That turned an 83-81 Suns lead to start the fourth into a 100-91 Bulls lead with 5:05 remaining. The hot shooting Suns with P.J. Tucker scoring 20 points with four of seven threes kept coming. But after the late Rose and Gasol scores, the Suns had to foul. Rose made two with 15.5 seconds left and leading 108-107. And then Butler made two after Eric Bledsoe rushed up an attempt to tie with a three with 7.8 seconds remaining. But perhaps this can be yet another reset for a team that’s had so many this season. Gibson was the fourth quarter catalyst with a 17 footer to open the scoring, a lob dunk on a pass from Noah and 10 of his 12 points. He also spoke eloquently and in depth about a torn ligament in his hand he’d played with the last month without revealing it publicly. Though it hindered him and raised questions about his play, Gibson endured as he related in a story I wrote earlier on Bulls.com. Gibson’s refusal to sit out and play through the criticism which engendered trade rumors will perhaps be another turning point for this roller coaster Bulls team that moved to 35-21 and 16-11 at home. They’re perhaps still caught in an identity crisis of a team built around defense that has changed character this season and now has enough offensive talent for the first time in more than a decade to play with the high scoring teams of the league. That requires faster play and more shooting, which is the blueprint for the current NBA game. It’s no coincidence the Bulls have had most of their best games against Western Conference teams that increase the pace of play. The Suns are among the leaders at that with their guard oriented shooting game. And the Bulls responded with a game to match, but with their superior rebounding and physical play. The Bulls outrebounded the Suns 47-36 with a 16-7 edge in second chance points. But then the Bulls this time, unlike against many Eastern teams, didn’t settle for half court isolation play and numerous play calls. They got more shots for Tony Snell and Nikola Mirotic and 37 bench points, attempted those 24 threes, which helped open the court and thus provided better driving lanes and a quicker pace so they didn’t have to strain for every basket. “We’re a totally different team when we play with an up tempo type pace,” said Rose, just one of many players yearning to speed up the game. “We’re a totally different team; we’ve got a lot of shooters. Thibs is doing a great job of putting shooters in the game and they are knocking down shots. Mike, I look for him on the break every time and he is doing a good job of pulling the trigger. The Bulls did a good job with that to start Saturday as Dunleavy made a pair of threes, one on a pass from Rose, and then Rose added a three as the Bulls took a 33-28 first quarter lead. The Bulls got an excellent, hustling and good shooting stretch in the second quarter from Mirotic, whose spot up shooting is perhaps better than anyone’s on the team. He’s a valuable addition. But the Suns with Rose drawing a third foul pulled away late in the quarter to take a 56-52 halftime lead with their quick draw shooting game. It looked bad for the Bulls with another indifferent third quarter with too much isolation play and quick shots that enabled the Suns to take an 81-73 lead. Though Butler did finish a pretty lob dunk on a pass from Dunleavy. 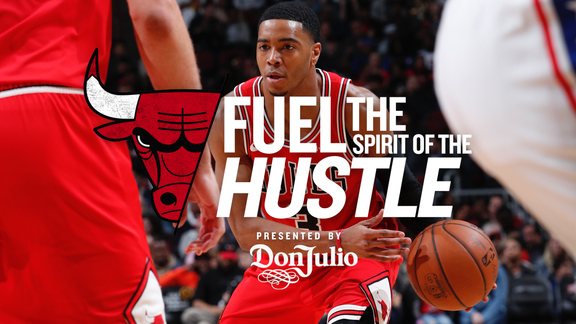 But Rose had a vigorous left handed driving layup and Gasol closed the quarter with a three (seven of 14 on the season) and his 11 points and six rebounds in the third pulled the Bulls within 83-81 to start the fourth. Then it was an eclectic lineup of defense with Gibson and Noah, and shooting with Snell, Mirotic and Brooks, Thibodeau keeping at least two three-point shooters on the floor for longer stretches in this game. That quintet scored on seven of their first eight possessions while Noah and Gibson shut down the inside and Snell and Mirotic did a good job closing on the perimeter. And then Rose, Gasol and Butler closed it out.